All stick floats have two halves, a buoyant top section and heavy bottom half. The idea is the buoyant top holds the float up and the heavy bottom acts as a stabiliser like the ballast of a ship or the keel of a yacht. It’s not like a loaded float where some of the shot carrying capacity is built into the float, the bottom half is designed to help maintain the floats stability in running water, especially when held back. Lignum is a dense wood that does not float, making it an ideal natural material to use to help stabilise and control the buoyant top. Lignum floats are good in a steady, even flow. whereas wire stem are better in a more boily swim. the weight and thinness of the wire stem is less effected by turbulent water. Find the rough depth of your swim, unlike still water fishing dead depth is not usually needed, adjustments can be made as you fish. I generally use main lines of 2 to 4lb with a hooklength of a lower breaking strain attached with a four turn water knot, but you can loop to loop if you prefer. Sticks don’t have an eye for the line. The float is attached with three silicone rubber bands. The bottom rubber extend beyond the end of the float to cut down on tangles. Conveniently float rubbers allow the float to be changed easily if conditions change. There are three main factors, depth of water, strength of current and strength and direction of the wind. As a rough guide, use one No.4 for each foot of water. Unless the flow is slow in which case use a lighter float, or if the flow is strong use up to two No.4’s per foot. I also test to see how the float behaves when held static in the flow. If it’s at an acute angle I will use a heavier float. Whatever size of float you chose, the real acid test is how you feel it’s fishing. The shirt button shotting pattern is commonly used and is simply equally spaced small shot added down the line. They make up the floats shot carrying capacity, with the first shot directly under the float. Except for the last few shot nearest the hook, for which I use smaller shot. Although the shot carrying capacity of stick floats are often described in No.4’s, you do not need to use No.4’s. Many anglers use nothing but No.8’s to load the float. 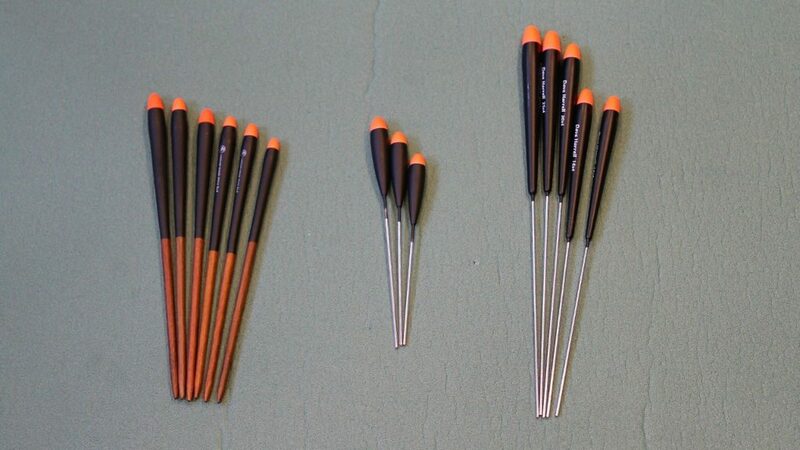 No.8’s are the biggest shot still made of lead and lead is softer than non toxic shot used in the larger sizes. Which means it’s kinder to the fine lines used in stick float fishing, the shot can moved up and down the line without causing damage. 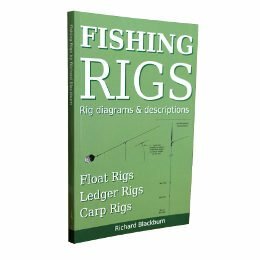 I often use fours and sixes in the top half of the rig and eights in the bottom half, with the last about No.8 twelve inches from the hook. Although I might change that as I’m fishing, it all depends what works on the day. 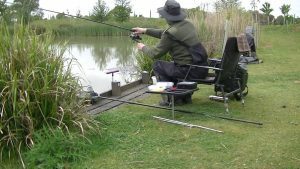 It can take quite some time to attach all the shot, some anglers make their rigs beforehand and put them on winders ready to go, just like a pole rig. One of the problems with fishing rivers is that the lower layers move more slowly than the surface or upper layers. If you would like to know more this search “stream flow measurement” on the internet, there is extensive info on how rivers flow. For our purposes we just need to know that rivers flow more slowly near the bottom. Lets imagine a float going down steam unhindered. The faster flow at the surface makes the float race along pulling the rig and bait behind it, causing the bait to be pulled along much quicker than the lower slow moving layer it’s in. 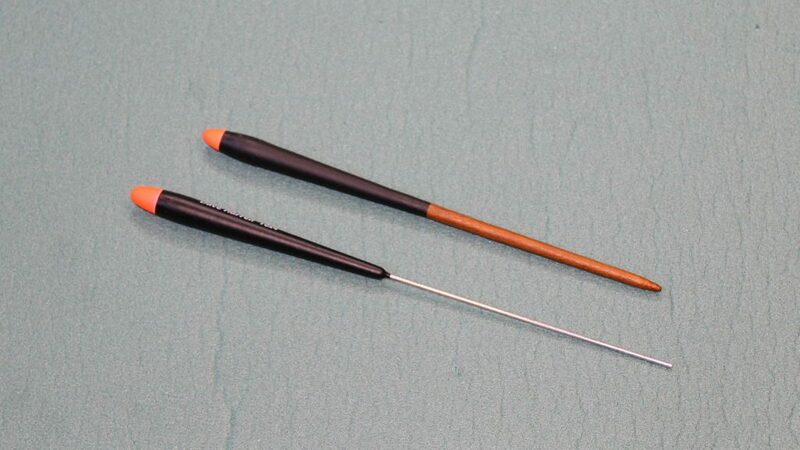 Stick floats are designed to be slowed down, without being pulled under by the current or misbehaving in some way. The idea is to match the speed of flow in the layer that your bait is fishing, making the bait look like it’s being carried along by the current in a natural way. To ensure the bait moves at the correct speed you will have to hold the float back. Holding back is done by the angler with the controlled release of line. There are two main ways of doing this. Either by holding the rod pointing slightly down stream and directly controlling the rate the line is let out. A centre pin reel wins hands down with this method. By allowing the float to pull line off the reel with the angler slowing the reel by touching the edge of the spool when required. The second method is with a fixed spool reel. With the bail arm open trap the line against the spool with your finger and then use the rod to control the floats progress. Slowly move the rod to guide the float downstream, at some point release the line move the rod back letting line out then re-trap the line and continue easing the float down. With the float held back, the current will push against the float, line and shot of the rig. The float will be at an angle and the line beneath it will also be pushed to an angle, causing the bait to move out in front of the float. This is correct and is what the rig is supposed to do. 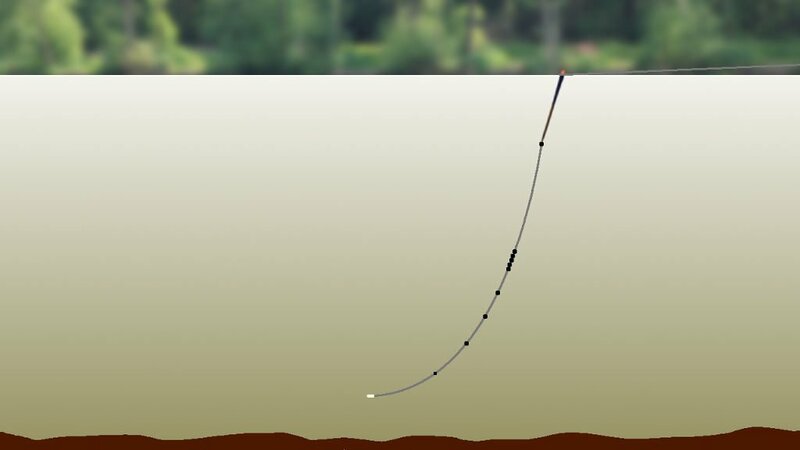 You will have to take into account the line being at an angle, by increasing the length of the line between float and hook to ensure your bait is near the bottom. But remember there is nothing wrong with fishing mid water if that’s where the fish are. Because everything is tight to the float, the slightest bite will register immediately and your strike will connect immediately because there is very little slack between rod and hook. Small shot in a shirt button pattern help to create a smooth curve in the line. With the shot spread out down the line I believe the rig behaves better and registers bites better. Tell tale is just part of this pattern working together. But there is a second reason to use a load of small shot and that is the ability of a stick float to explore different layers. If you hold the float back hard or even stop it’s progress completely, the bait will rise up in the water. Releasing the float will then allow the bait to drop back down through the layers in a natural way. In other words you will be fishing on the drop, which works better if the shot are small. Needless to say you can repeat this several time down the swim allowing you to explore much more of the water. Holding back hard can also be used to lift the rig over a snag or shallow area. The ability of the rig to fish on the drop can also be a nuisance if there are shoals of bleak or other small fish in the swim. They can intercept the bait on the cast which means you don’t get the chance to trot down the swim. 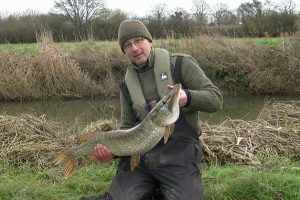 One answer is to bulk some of the shot just below half way to get the bait quickly past the tiddlers. It’s not ideal but you will get past the tiddlers and still be able to fish the float as described because most of the work is done by the last few feet of line. If you do need to bulk the shot, leave one shot under the float not only to help stabilise the float, but also as a marker for depth if the float moves at all. 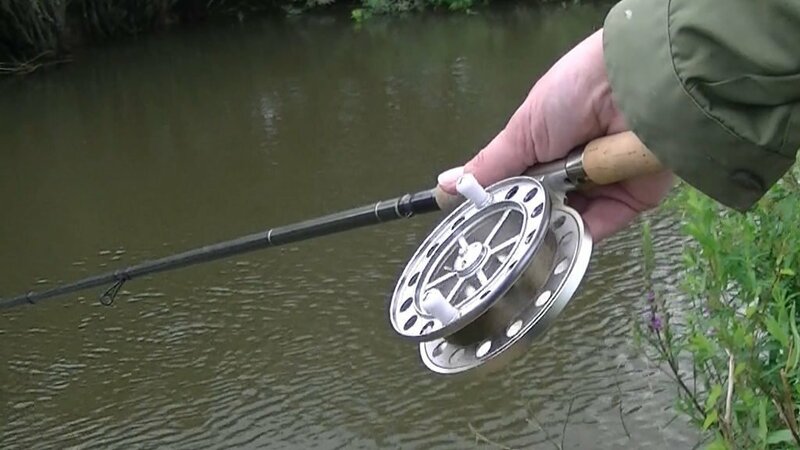 The shirt button rig is ideal for rivers between 3 and 6 feet deep and can be regarded as the classic stick float rig and often a good starting point. Fishing in water over six feet is another time I would recommend changing the rig. Stay with the shirt button pattern, but instead of starting directly under the float start it half way down spacing the shot equally as before. Keep one shot under the float as a marker and for stability. Floats fixed top and bottom are better cast under arm or to the side. Always cast your stick float downstream of your location. Feather down to ensure the rig lands out straight and in line with the flow. This allows the rig to start fishing as soon as it hits the water. To be able to hold the float back effectively, the line has to be behind the float parallel to the current. 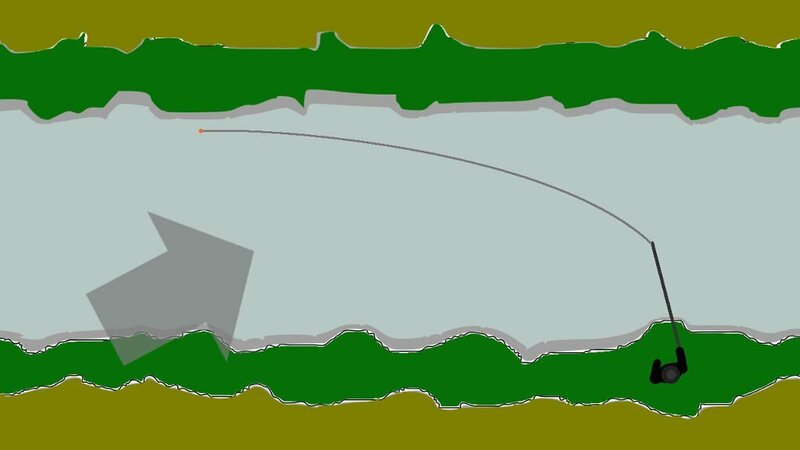 If you try to fish too far out or on the far side of the river the faster water in the middle will pull the line causing the float to move diagonally. If you lift the line off the water, but the wind is blowing in your face, the wind will pull the float off course. If the wind is blowing downstream it will cause the water at the surface run faster making it very difficult to keep the line behind the float. If the wind is blowing diagonally upstream, it will help to hold the line in the correct place. If the wind is blowing upstream it will help to keep the line behind the float and even help to control the pace of the float. So to use the stick effectively, you must also take into account the wind speed and direction. If you want to fish a stick float in awkward conditions them use a wire stem stick, it’s greater stability will make it easier to use. In a down stream wind you can add a small back shot to sink the line to get most of it away from the wind accelerated surface. Other than when using a back lead or holding back hard, the line should be on the surface. Not yards of line but just the last few feet. To make sure the line floats, apply line floatant or Vaseline to five or six feet of line above the float. This makes it easier to mend the line and keep it behind the float. Mending the line is done by lifting the line off the surface and place it back down behind the float parallel to the flow. How much do you hold the float back? I like to start at half the surface speed, but to be honest you will have to experiment. Start with half speed then slow it down or allow it to run faster and see what happens. Feed the swim little and often, expect to use a fair amount of feed. With maggots for example I would expect to use two or three pints in four hours. It takes about six second for a maggot to drop one foot through the water. So your feed may be some distance down stream before it gets to the right depth. Concentrate on fishing the same line. By all means feed two lines, one close and one out near the middle, but try not to spread your feed all over the river. Use a bait dropper if the flow is strong or the swim is short. The main strength of the stick float is it’s ability to present the bait in a very natural way. With small baits like maggots and casters, the lignum stick float is perfect. But when conditions are not quite right, the wire stem stick float comes into it’s own.